Our second retreat to the 1800’s for source material in a matter of months with this evergreen song which is on its way to becoming a fairly reliable staple in rock circles just as it’d been in pop and blues circles before that. But whether tackling something already so well-established is good for rock’s emerging image as a new, vibrant and exciting brand of music for the modern age or if it’s an unnecessary concession to the past by suggesting audiences might be skeptical of newer material is something that’s yet to be determined. Making this effort even more perilous to their reputation was the fact that The Ravens were competing with another well done version on the outskirts of the rock field that was fresh in listeners minds. If their take on the song didn’t measure up to their competitors then they might suffer twice for their troubles. First by not getting a hit out of the record, but secondly because it’d call into question their abilities to deliver a definitive performance. That was something The Ravens, by virtue of their unique attributes, never had to worry much about. No vocal act in the world had anything to measure up with the deep honey-toned Jimmy Ricks, and few could then turn around and offer a fragile crystalline voice like Maithe Marshall to offset that. Add to the fact there had been so few vocal groups in rock during its first two years which meant The Ravens virtually had the field to themselves. Even when The Orioles came along last summer as their most serious threat it was with an entirely different stylistic approach, one stripped down to the raw emotions of a song featuring more ragged harmonies and a soulful lead. But now the vocal group realm was starting to become a bit more crowded, something The Ravens were obviously responsible for. The Robins had just come along as direct descendants of The Ravens, but more telling might be the fact that pop-centric vocal groups were beginning to move into their territory as of late including one of the few black vocal groups whose own success to date could arguably match that of The Ravens. We’re talking about The Four Tunes, a group who’ve made a handful of appearances on these pages when they’ve tried their hand in rock – usually the outskirts of rock, for what it’s worth – but who’d had some big hits backing female vocalist Savannah Churchill dating back to 1947. In many ways the two groups were reflective of the divergent roads black secular vocal groups of the late 1940’s were taking. The Four Tunes had stuck closer to the model of the pre-rock pop crossover acts like The Ink Spots, from whom they’d been spawned initially as a one time member formed the group which eventually morphed into The Four Tunes. This approach valued pleasantly melodic songs delivered with a touch of class and little in the way of any readily apparent ethnic shadings. The Ravens on the other hand – at least with Ricks-led numbers – drenched their songs with all of the soulful attributes of black culture and with their rock songs pulling no punches in terms of content, even if it was delivered more with a wink and a nod rather than a moan and scream, you knew what they were getting it all the same. But each group proved not to be entirely satisfied with their own chosen niche, as The Four Tunes tried their hand with injecting more passion into some of their songs to reach the listeners who were making rock the up and coming style of the day, while The Ravens were dressing up their approach to hope to draw in some older more respectable listeners for a change. Now, on Careless Love, their separate paths finally cross. For many, if not most of you, I would suspect the most pressing question regarding these two competing versions released just two months apart will be: Which one is better? Okay, that’s understandable and obviously the answer to that will be seen by the scores each record gets here. But that’s not the most important question at all. What’s more interesting when it comes to cover versions is what each artist does to make it their own. The song itself may be the same but the ways in which to shape it to suit your own aesthetic values can – and should – vary greatly. No song is ever so rigid that you should expect to hear carbon copies just because two artists both decide to tackle the same composition. Now the last time we had to deal with this matter with The Ravens was last fall when they hastily released their own It’s Too Soon To Know and came up well short of the Orioles original. 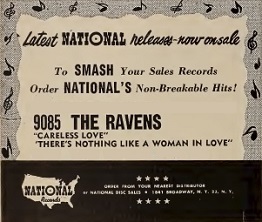 Though both got hits out of the song, The Ravens didn’t match the commercial impact, despite having far more name recognition and a stronger label, and they certainly didn’t match the delivery. On that, almost seeming to realize that there was nothing they could do to improve upon Sonny Til’s stunning rendition, they attempted to tweak the melody which proved to be far too delicate to mess with. 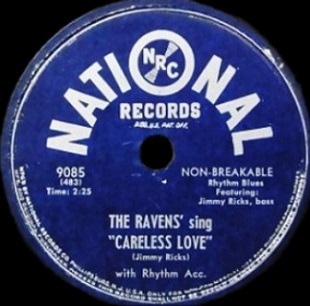 But with Careless Love, though clearly recorded in response to The Four Tunes record, they had a song that was much more sturdy to bend and shape the way the saw fit without worrying about breaking the tune. For starters The Ravens scale back the lyrics to just one basic stanza, one which acted as the summary in most other – deeper – versions, including that of The Four Tunes who used most of the original lyrics in theirs (it should be noted that the song being so old had many verses that were substituted for the original ones over the years). Now from a storyline perspective this edited script means it can’t dig as deep as The Four Tunes do, as this version lacking both the details and the context to set up the main lesson they’re imparting. Yet because they pare it down to just the basic theme, effectively stripping the meat from the bone, we may in fact get a more emotionally direct reading, especially when you factor in just who it is who’s singing this. For those assuming that Maithe Marshall, who typically took the lead on all of the older pop material, would step to the microphone for this, fear not, because this is the Jimmy Ricks show through and through. Whether this was done because of the less than stellar commercial returns on the Marshall led sides, or because of the desire to have it stand out from The Four Tunes, who DO use a higher lead, or simply because Ricks decided that he and his sonorous bass voice was the right one to embody the weighty burden the song requires, we can’t be sure. But what we CAN be sure of is he’s going to project the proper emotional gravitas if nothing else and his featured presence will distance it from The Four Tunes in the most obvious way imaginable. Call it hedging your bets or even bringing in a ringer to try and ensure you jump out to a lead, but you’d have to call it smart no matter how cynical you were. It also helps that the song itself is so familiar. Not just because we recently heard The Four Tunes take on it but because there’s been no shortage of interpretations over the years no matter what era or style of music you prefer. In 1949 there were still those around New Orleans who may have remembered Buddy Bolden’s pioneering jazz band at the turn of the century playing this. Certainly Bessie Smith’s legendary take on it from 1925 with Louis Armstrong accompanying her was recent enough to be recalled (I know the names and dates seem ancient now but for comparison keep in mind that in 1949 that was no longer ago than Nothin’ But A “G” Thang by Dr. Dre and Snoop Dogg or Whitney Houston’s I Will Always Love You is when looking back from 2018). For fans of the current musical climate of 1949 a familiar figure in Big Joe Turner had already cut this twice over the past decade in two decidedly different approaches. In the first he was accompanied by just a piano and kept the tune mournfully slow, sounding as if it were destined to be played over a sepia-toned montage of days gone by. A few years later at the tail end of 1947 he had another whack at it using a full band with decidedly jazzy horns that comes across as rather jaunty considering the downbeat theme. In the 1950’s he’d give it the rock ‘n’ roll treatment, speeding the tempo even more, adding a backbeat and a sax solo. Just to show how durable the song was it worked well in all three drastically different versions. So The Ravens were on pretty safe ground with Careless Love no matter how they did this… provided of course they utilized their own strengths. That would be Jimmy Ricks of course who has the responsibility of making you feel sympathetic to his plight, as they take this at the tempo it usually stuck to, ramping up the emotional anguish of his wrecked love life. The other Ravens are there for support of course, kicking this off with a familiar “Doo-doo-doo-doot” refrain that calls to mind their similar intros to everything from Old Man River to Summertime. But as uninventive as it might be to recycle essentially the same approach for that, it’s no less fitting in this song and gives it a solid enough base to work from, especially with Howard Biggs’s piano throwing in slightly funky fills with a muted guitar adding very subtle responses. But it’s Ricks we’ve come to hear and it’s Ricks we’re going to get as he eases his way into the picture, his voice as seductively sleepy as ever, riding the melody effortlessly as he tries pulling us under his spell once again. What’s notable however is the conflict Ricks seems to have over his tortured existence. As he drawls out the bare bones tale of his misery, the part about weeping and moaning (and just for the record, moaning is Ricks’ stock in trade at times as a singer), he’s also clearly not about to QUIT his attempts at romantic, and presumably physical, fulfillment with the ladies in spite of his previous bad fortune, something which shifts its message in comparison to other versions where the singers are resigned to being thwarted in love. Because of this the record swings, or sways as it were, melodically that is, between sorrow and desire, between weary resignation and cautious hope, and few are better able to believably switch outlooks as smoothly as Jimmy Ricks. He bears down just hard enough to hit you with one mood, then seems to struggle to rein in his growing optimism in the next line. Yet he’s not holding it in at all, but in fact only drawing out the transformation for maximum impact so that when he does release it in the form of some soaring lines you get the sense that he was in fact overpowered by the feelings themselves, rather than just an actor playing a part. He wasn’t the best rock singer of the 1940’s for nothing and this is more evidence to support such a claim. But whether this makes for the best platform for the song itself is another matter entirely. They’ve stripped the song down lyrically so much that they’ve turned it from a weighty story into merely an emotionally cathartic exercise. It uses but two lines of the composition and repeats even those within their reading. You get a snapshot rather than a movie of the sentiments as a result. Furthermore they haven’t give the other Ravens nearly enough to do and when singing the bridge they’ve been divested of even that remaining emotional aspect, instead acting as merely a polite interlude so Ricks’s return will have more of a kick. In other words they’re leaning so heavily on their superstar that they’ve sold the rest of the song short. Careless Love is still such a good tune melodically, and the lyrics they’ve kept are still potent, that it can’t help but be appealing to some degree. Add in the sheer force of presence that Ricks carries with him anytime he opens his mouth and it’s a safe bet that you’ll never be unwilling to sit through what he’s offering up. But in comparison to The Four Tunes who seemed to try and come up with a way for their entire group to contribute, The Ravens relied almost exclusively on the superpowers of Jimmy Ricks. He didn’t let them down by any means, but in the end the fact remains that rock vocal groups are at their core a team sport and while you may have the best player in the game, you can’t let him take every shot and still expect to win. This is still good and Ricks himself is great, but The Four Tunes give you just a little bit more to grab hold of and that makes all the difference. 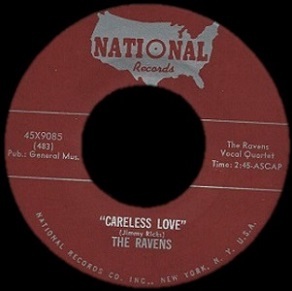 Leave a reply on "The Ravens: “Careless Love”"